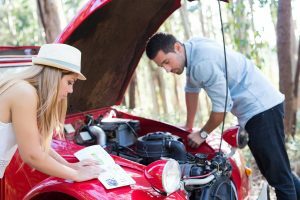 Home » Sacramento Towing Blog » How to Prepare Your Car for the Summer? It may look far, but the truth is, summer is just around the corner, and summer preparations are already on their way or at least should be. From planning your yearly summer vacation to finding a good summer camp for your kids, or even making sure you have a nice place to sit outside during those long summer nights with your family. That’s right, summer is on its way, and somewhere in the list of all the things you need to prepare to make sure you are ready for its arrival – your car should be included. You need to make sure that your car is ready for the moment when the temperature changes and the weather become hotter and hotter still. These preparations are important not only to make sure you’re comfortable during the hot season but also to make sure you’re safe. So here is a list of a few things you can do to prepare your car for the summer. During the hot summer days, all everyone wants to do is get into a cool place that offers air-conditioning and your car is no exception. A working air–conditioning system in your car is one of the most important things to have during the warm season. You can never know how hot it could get outside and making sure that your car’s air conditioning system is keeping you nice and cool when it’s scorching hot outside, is vital. Especially when you think of how hot it can get inside the car because most times the temperature inside when the A/C is off will be even higher than the one outside. Overheating can lead to dehydration, severe migraines, weakness, etc. These side effects can affect your driving, and even put you in life threating situations. So, it is best to make sure that your air conditioning system is working properly. Another thing that gets warm during the summer besides the weather is the roads you are driving on. During summertime, the roads get hotter and hotter. This can have an immediate effect on your tires, in case they are old and worn out. Old, worn out tires are already a dangerous thing, but combine that with a boiling road, and you get an actual life threating situation. Furthermore, it is recommended to have your car’s tires checked at least twice a year, once at the beginning of winter, and the second time at the beginning of summer. So, whether you need to have your car’s tires replaced or not – it is best to make sure you do a tire check-up, before summer starts. Remember those rainy, fogy and even snowy winter days when the vision wasn’t as perfect as it could be, so you had to keep hitting the brakes just to make sure you are driving carefully? Remember those busy mornings during the wintertime when everyone got back from vacation, and you have found yourself stuck in traffic, hitting the breaks again and again just to make sure you won’t crash? Well, if you do, you can probably already say that your car’s breaks have been working hard during the winter season. And the harder they worked – the more worn out they are. That is why it is important to add a brake check to your car’s preparations for the summer. Got stuck with your car during a hot summer day? No worry, in Auto Towing Sacramento we provide an around the clock professional towing service alongside many other solutions! Call us today!